Get spa pedicure results at home! 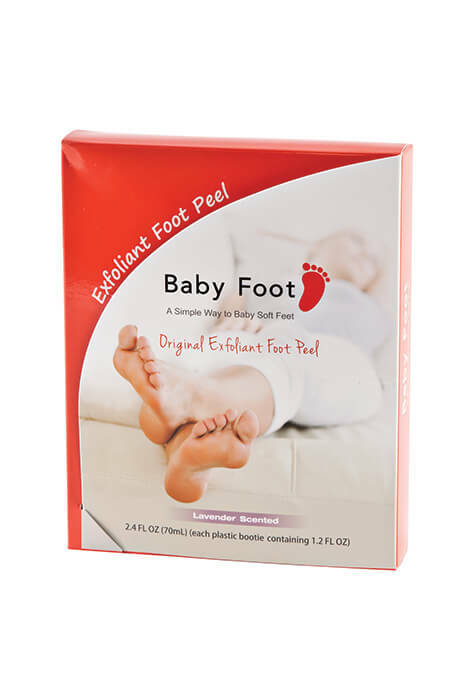 Get spa pedicure results at home with Baby Foot exfoliating peel! This exfoliating foot peel removes rough skin and calluses effortlessly in a single application. Just put on adjustable booties and relax for 90 to 120 minutes. Tired skin peels away for three to five days after treatment to reveal soft, supple feet. Wash & dry feet, place feet in Baby Foot pack & secure with the double sided tape. Leave on feet for 2 hours and allow the gel to be absorbed into the skin. Remove pack and wash feet gently with soap. Water activates Baby Foot. Thoroughly wet your feet each day. Dead skin will start to peel within 5-7 days. Do not forcibly remove dead skin when peeling process begins. Dead skin cells will peel off within 3-4 weeks leaving your feet soft & smooth. Recommended frequency: approximately every 3-4 months. I am a fitness instructor teaching over 12 classes per week! Great product to remove dry, rough skin. Does leave feet "baby smooth." I continued my normal activity routine after using. I did have to wear socks during my yoga/Pilates classes during the extreme peeling days! (only 1-2classes). I did use a pumice stone to help the exfoliation process too. Hardest part for me was sitting for the 90-120 minutes to apply product. I didn't realize I don't EVER sit that long in one sitting! I'm going to have to buy this again. I like to do my pedicure at home its safer. I've walked bare foot ince I was four. After hearing about this on the Today show I have used it twice. It takes about a week to begin peeling and is unsightly for a week but it does remove a layer of skin on the entire foot. Foot is left much smoother and softer. !!! !Finally~a solution to end calluses!!!! I am a very active, healthy 67 year old woman. I love it when people think I'm 40 something. I have always made time for "ME TIME". My instructions said leave on for one hour. During that hour I waxed my brows and did my pedicure. The only area I have calluses are on the side of my big toes. Within 15 minutes after putting the booties on, I could actually feel the solution penetrating those hard, ugly, stubborn calluses on my toes. During the first week, I was in total awe as layers of dried, dead skin starting peeling off the bottom of my feet. I wasn't even aware my feet had dead skin because I always pamper myself from head to toe on a daily basis. This product lives up to its name. Shoppers/Buyers~you will not be disappointed with this purchase. I am absolutely amazed by this product! I will definitely use this again . I used the treatment on 12/28/16 and it is now 1/10/17 and my feet are sooo soft and are still shedding dead skin! My callous' were so thick it was painful. I could not put a debt in them with normal tools, I'm 36 and I could not believe how bad my feet were. I'm so happy. Today I could walk around with no pain! Best product ever for dry skin on feet! I am extremely hard on my feet and have had dry, cracked feet as long as I can remember. I have tried every lotion and remedy on the market and this product is the only one with great results. I am self conscious of my feet so I rarely get pedicures and "baby feet" allows me to get great results in the privacy of my home. Two thumbs up! I've never seen anything peel like this! My heel callouses slid off in chunks! I was amazed. The downside is that this peel needs at least two weeks to finish working. I followed instructions and sat for an hour with the booties on. (Very hard to walk in them, and potentially unsafe, so I don't recommend it.) Near the end of the hour, I could feel the effects of the solution and I was happy to rinse it off. After that I totally forgot about it until a few days later, when I first noticed the skin on my feet sliding off in the shower. I was amazed! But the peeling continues for a few days after, so I would not use this product within two weeks of having to be out in public with bare feet, unless you don't care about being out with skin peeling off like you have some sort of foot fungus! Besides that, I am very pleased with the results. My feet are transformed. This product is amazing! I use it twice a year, start of summer and winter. Easy to use, feet start peeling dead skin in 4-5 days and after that your feet are beautiful. Whoa I can't believe it! I tried this product not expecting anything towork at all. After I did it. Nothing. About 5days later,YIKES. So much dead skin came off I couldn't believe it. It was both disgusting and fabulous. It took a week to be fully done sloughing. So, don't use this product within 2 weeks of an strappy sandles event. But 3 weeks after, you will LOVE it. New to soft feet? this works! If you normally do not scrub your feet with pumice on a daily basis you will see tremendous results. I'm constantly scrubbing my feet with pumice and noticed a sloughing of more skin even after using baby feet. Great product for keeping feet smooth. Removes dry cracked skin on feet! At [$] the product is a little too expensive for me to use as often as I would like to. I have terrible dry, cracked feet and it is hard to keep them smooth. It is a great product and I will use it again. I am a very active 63 year old. I was excited when I saw the product until I bought it and read the "after product use" info on the box. 'Limit activity while feet are peeling & about a week after--no long walking, jogging, exercising or high heels.' I simply don't know when I will be able to find a time in my life when I can avoid all of these activities for that long!! Love, love this product, my feet were as smooth as silk. I've used this several times. This works & peels off dead skin for 2 weeks! Because I know it works. This Product really works results are fantastic ! I have used this product before and was pleased with the results. This product is amazing. Follow the instructions, and you'll be hooked for life. From everything that I've heard, this product is amazing. It's getting close to pedicure season in Massachusetts. I want soft baby feet. Tired of the the sand paper rollers- I know this works!!! I'm looking for atraumatic ways to battle my calluses. A request from my wife. read good reviews on it in the past decided to try it. In the summer my feet get very callused. I use other products to reduce the calluses, but have to keep after them. My feet are very dry and my heels are cracked. I thought this would help. I tried it before and it did not do exactly what it was supposed to so I'm trying again. It works great!!! Better than a pedicure! Best product on the market to end up with baby soft feet. I have to check how it is working. Maybe advertising not correct. Wanting to see if this helps with some problems i have been having with my feet. Because I heard about it and I want to try it. I have a lot of rough patches on my feet and am hoping this will help. I've used before and works amazing!! Saw a "you tube" video, and read reviews. i used it and absolutely loved the results! I am getting these for Christmas gifts for all 3 of my children, and me another 1! To remove calloused skin which is painful when I walk. I've read wonderful reviews about this product and am very excited about trying it. It will be nice to sit and read a nice book while Baby Foot takes years of dry skin off of my feet. You can't take long walks or exercise for a week after applying? Really? BEST ANSWER: That was not the case at all! 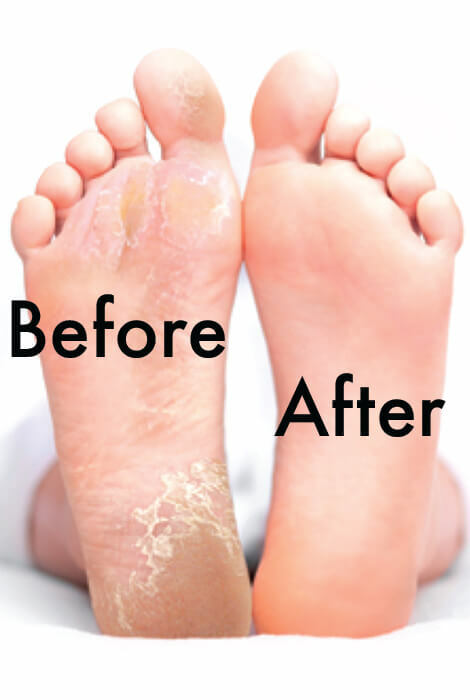 In about 4 or 5 days after using product, the skin on your feet will start peeling off like a sunburn. You are not supposed to pull it off, just let it fall off, which is very messy. Wear socks! Skin will peel for several days. Soaking your feet helps the process. Then your feet will start to feel very smooth. Of course you can! Your daily activities never change! In about a week they peel and sandles aren't the best look for a few days but you can deal with that for the fantastic results you'll get! I love it and so does everyone that I've suggested try it! I did. I applied mine during a ski trip and skied every day. Didn't have a problem. Enjoy your soft feet! Is the Baby Foot Pack reuseable? BEST ANSWER: No, it is a single-use product. I put mine on after a bath. You will put them on your feet the way you would socks and secure around your ankles. The solution contains a fruit acid and the peeling occurs over a several days. No because it peels off just like a face peel.